Could A 2-Year-Old Boy Be 'Patient Zero' For The Ebola Outbreak? : Goats and Soda Scientists now think the entire outbreak in West Africa was triggered by one person and then the virus took off from there. Early signs pointed to a little boy in southern Guinea. Could A 2-Year-Old Boy Be 'Patient Zero' For The Ebola Outbreak? 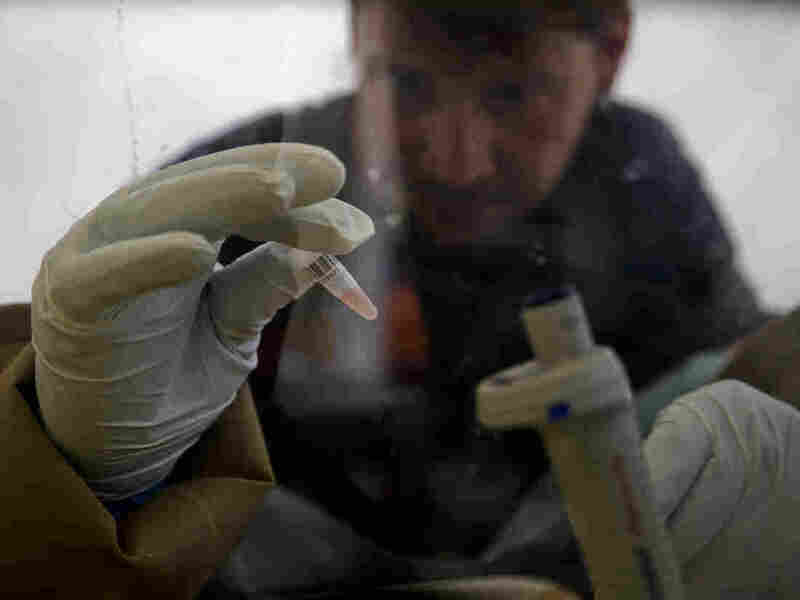 A scientist tests a patient's blood for Ebola at the European Mobile Laboratory in Gueckedou, Guinea. The first cases reported in the outbreak occurred in a small village about eight miles outside Gueckedou. Back in early December, a little boy in southern Guinea caught a mysterious disease. He had a fever, was vomiting and had blood in his stool. The boy died a few days later. Before he did, he passed the disease to his 3-year-old sister, his mother, his grandmother and a midwife. The latter was eventually hospitalized in Gueckedou, a nearby city of 200,000 people. 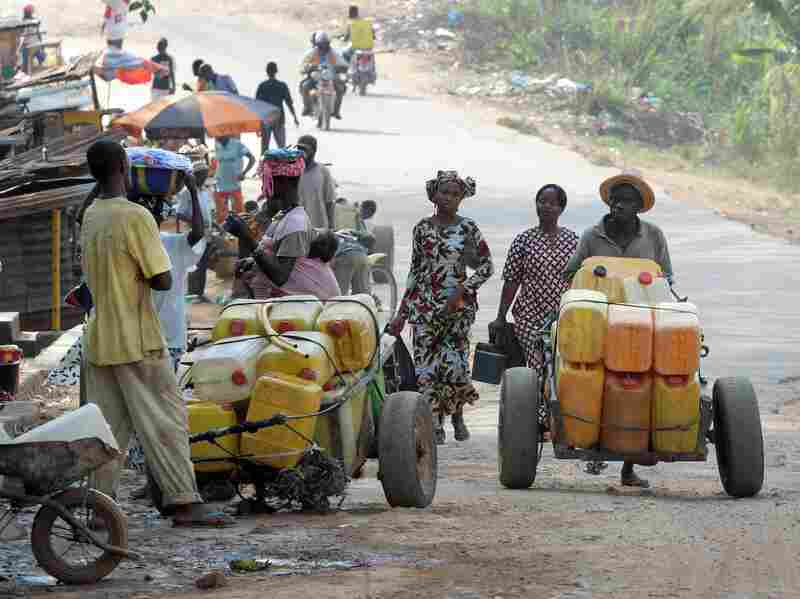 Street vendors sell water on a street of Gueckedou — the city in Guinea where the Ebola outbreak began. Bordering Sierra Leone and Liberia, Gueckedou is a bustling city of more than 200,000 people. By March, the disease spread to four cities. And international health officials realized they had an Ebola outbreak on their hands. The virus quickly spilled over into Sierra Leone, Liberia and Nigeria. Now more 1,400 have died in the outbreak, the World Health Organization says. Back in April, an international team of scientists reported in The New England Journal of Medicine that this little boy, just 2 years old, likely triggered the entire Ebola outbreak in Guinea. Some called the boy "patient zero." But others think his story offers insights to how the outbreak grew so fast. "There is a physician that started to draw that chain of transmission, that went all the way to two kids — 2 years old, 3 years old," says Pierre Rollin, an infectious disease doctor with the Centers for Disease Control and Prevention. He just returned to the U.S. from Guinea. Rollin thinks these two kids were likely early cases of the outbreak but not the first cases. "Lots of people are talking about patient zero," Rollin says. "It's not patient zero. It's [that] the chain stopped there [at the boy] because we cannot find anybody else or nobody can remember anything." To find the origin of the outbreak, a team with Doctors Without Borders went to Gueckedou and interviewed people whose relatives had died of what looked like Ebola. "So it was a virtual chain," Rollin says. None of the cases were confirmed in the lab. And by the time researchers reached people, many had a hard time remembering what had happened months ago. But one thing is now clear, Rollin says: The entire outbreak in West Africa likely started with only one person, who caught the virus from a sick animal. Maybe a bat. Or another animal that had been infected by a bat. "So we think that there was only one introduction [from animals] and then from that it went from human to human to human to human," Rollin says. Scientists figured this out in two ways. First, every person they know who has been infected with Ebola, so far, has had contact with somebody else with the disease. "We always find a link with someone else who had been sick," Rollin says. "You always find this chain," he added. So the virus isn't just popping up seemingly randomly. Then there's the DNA evidence. Scientists have analyzed the genetic fingerprints of the virus in Sierra Leone and in Guinea. "It looks like they're either the same or very related," Rollin says. That match also suggests that there aren't hundreds of bat colonies swarming around West Africa infecting people. Instead there was just one source of the virus that infected a person way back in December, or possibly earlier. If that's the case, it means people in Guinea were getting Ebola and didn't realize it. That seems a bit surprising. How can you have Ebola and not realize it? There's actually a good reason. Another disease in West Africa has symptoms similar to Ebola. It's called Lassa Fever. It can even cause bleeding in the eyes, gums and nose. "Around five years ago, I was doing a study with a colleague from the U.S. Army, where we were looking at patients admitted for suspected Lassa fever, [but] who tested negative for Lassa," says Joseph Fair, an infectious disease doctor who works in Sierra Leone. Fair and his colleague found that many of these patients had common viruses, like West Nile, yellow fever and dengue. "But what was interesting is we did find two individuals — and that was up to five years ago — with recent exposure to Ebola Zaire," Fair says. That's the type of Ebola causing the outbreak right now. The team found only two patients with signs of a previous Ebola Zaire infection. But with the recent outbreak in region, that finding likely means that Ebola has been hiding out in animals in West Africa for years now. And it was waiting for just the right moment — and the right person — to launch an outbreak.